Arguably the most desirable semi-automatic pistol on the planet. Originally produced for test acceptance by the U. S. Army in 1906, there is some question about how many of this unique variation were actually made. The serial number of the example shown [on page 111] is "2", number "1" having been used in the actual test, while number "2" was for "back up". U. S. Army records of the test program indicate that pistol number "1" was subjected to severe use and abuse in the course of the tests. To date, serial number "1" has not been located and is thought by many collectors to have been discarded after the tests were completed. Though the progress of the American trials is well documented, controversy still surrounds the .45 Lugers. Work apparently began in the late summer of 1906, when 5000 cartridges were sent to Luger from Frankford Arsenal. The pistols were completed late in February 1907, two of them arriving at Springfield Armory some time prior to 28th March. One gun, believed to have been no. 1, was put through the trials whilst no. 2 was retained for examination. The latter still exists, thought he fate of its companion is unknown. But where are the others? And, if so, how many? 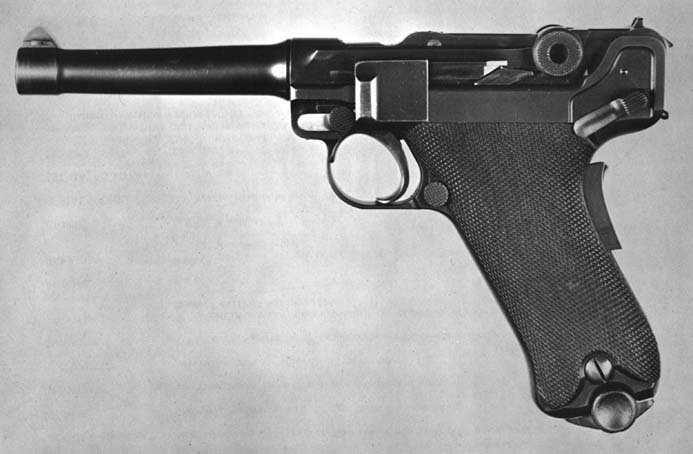 Deutsche Waffen und Munitionsfabriken clearly made more than two, as at least one would have been retained in Germany as a safeguard against the loss of the guns despatched to the USA; coincidentally, .45 Luger no. 4 is said to have been found in Germany in 1945 and taken to the USA as a souvenir. 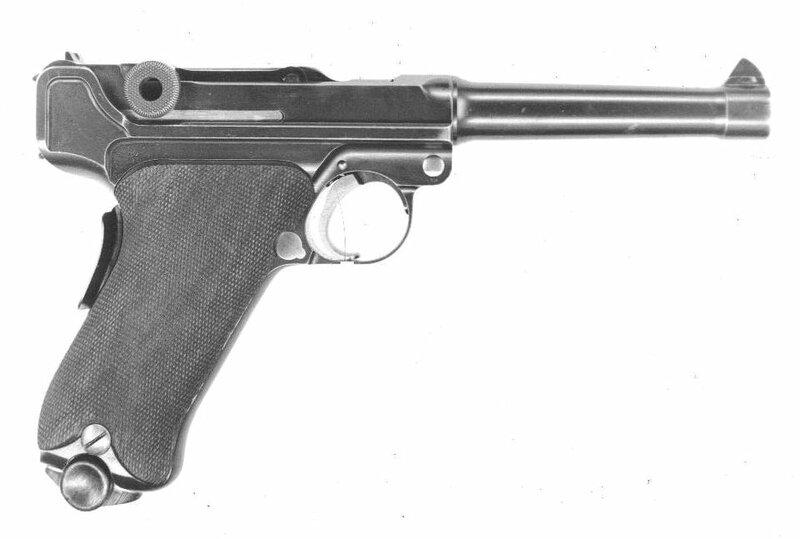 Another example, apparently numbered '4', was pictured in LUGER. The late August Weiss credited his predecessor, Heinrich Hoffmann, with a statement that "no more than six" 45 caliber guns had been made. 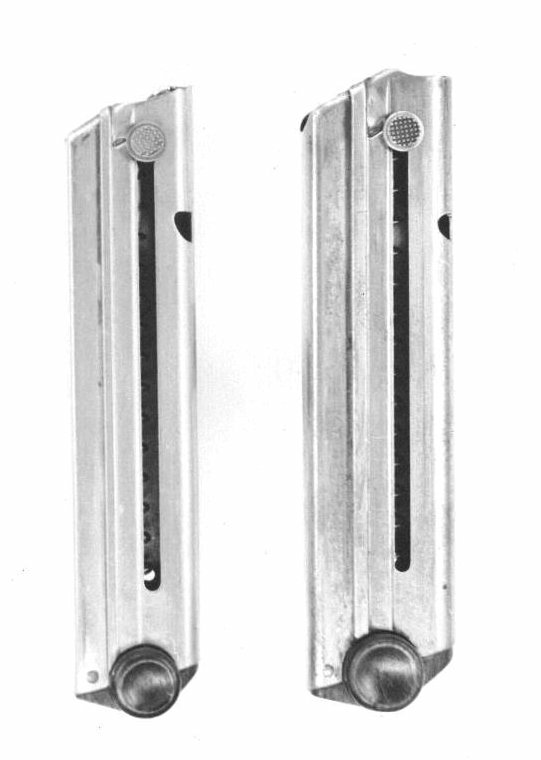 Harry Jones pictured two surviving .45 caliber pistols in the revised edition of LUGER VARIATIONS, commenting that the second survivor was fired 150 times in 1960 without a single stoppage. Unfortunately for Luger and DWM, the ammunition used in 1907 was not as reliable! It is reported that there is a .45 cal Luger in the Robert W. Norton Gallery, in Shreveport, Louisiana. 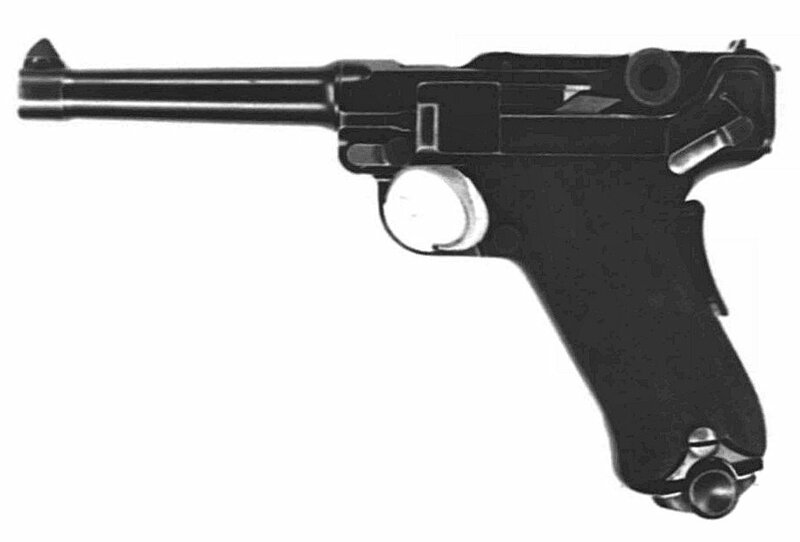 Mr. Norton was an early Louisiana oilman, and this Luger was purchased by Mr. Norton from Harry Jones. In some of his writings Harry Jones tells about himself and Mr. Norton taking the pistol out and running a box of ammo through it. The pistol is pictured on page 381 of Scott Meadow's "US MILITARY AUTOMATIC PISTOLS". The pistol has a commercial proof, but also has the GL proof on the toggle. This gun is not marked with a serial number, but the magazine is marked with the numeral "3" ...The origin of this particular specimen has not been determined, but much speculation has been made as can be seen in the writings above. The following photographs of the .45 caliber Luger, and its magazine, that was formerly of the Harry Jones collection and now resides in the Norton Gallery, have been provided through the courtesy and generosity of Mike Jones, from his father's photo archives. The photo of the right side of this gun is not known to have been previously published and is an exclusive addition to the Lugerforum. Copyright for these photographs is retained by Mike Jones.